Ugh, mojo is such a dumb word (unless we’re talking super intelligent monkey supervillains or card blogging hands), but I digress. While the weather is hitting record highs, so to are my blog hits. And I’m closing in on posting every day for a week straight for maybe the first time ever in the history of this blog. Things seem to finally coming together in my little corner of the blog netherverse. Anyway, we’re heading down the final stretch of the flea market posts. Only a couple more posts after this! Then I’ll have even more to post, since the flea market comes up again this Saturday. I’ll try to do this month’s flea market finds up much quicker though. There are also new sketch card posts in the offing. I colored seven more last night, and hope to finish the last two Justice Leaguers and three Star Trek captains later tonight. I also have at least three much-belated trade posts to post, and one fresh one at the moment, with more coming in the not-too-distant future. So things aren’t going to be slowing for probably the rest of this month anyway. I will be sending out a few trades this month too, some old (sorry it’s taken so long, guys), some new (I’m trying to be quicker about it). That all tediously said, let’s get to the action! Mojo Jojo Hand first! This was the other $1.50 card he gave me for $1 (it was apparently priced $6 at some point). It’s pretty cool looking, but it’s odd. The card isn’t #’ed, and the patch itself is making me say “hmm…”, because the colors seem to be reversed. I can’t figure out where the patch could possibly have come from. 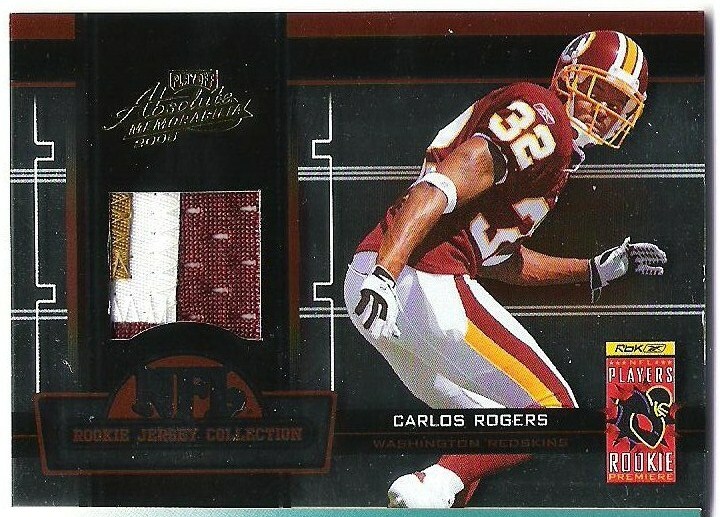 There doesn’t appear to be anywhere on the jersey where a thin strip of white patch meets red jersey with gold on the inside like that. I is confused and mayby have the eyesight of your average NBA ref, but it was only $1, so whatevs (any information most welcome though). I also have a regular non-patch version of this, probably pulled from an eBay “hot pack” or retail repack box at some point. Anyway, if you want either, have at thee! Now for the fun part of this entirely too long blog post, the next binder page!! Why Purchased: Hall of Famers and stars of their day on the most perfectly designed ever made, 1983 topps, and nearly vintage Yankee greats. 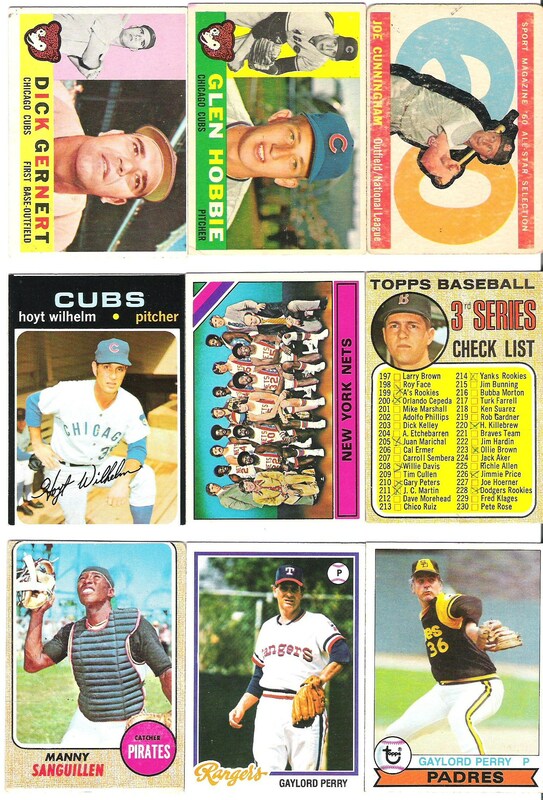 Notes: Why are topps Traded cards of the era ALWAYS in infinitely better shape than regular cards? You know how you end up with the name Graig? When one parent wants to name the kid Greg, and the other wants to name him Craig, and they decide to compromise. Which is proof that compromise is not always a good thing. At least they didn’t name him Jermajesty or Caleb or something awful like that. I didn’t know the Viola was a rookie until I was fooling around looking up late-’70s/mid-’80s rookies by year on Check Out My Cards. I enjoy Rookie Cups and Rated Rookies entirely too much. Mind-Blowing Statistic: Yaz had three 40-home run seasons, and no others over 30 (or 28 to be exact). I was struggling to come up with something, but that’s a pretty good interesting stat right? 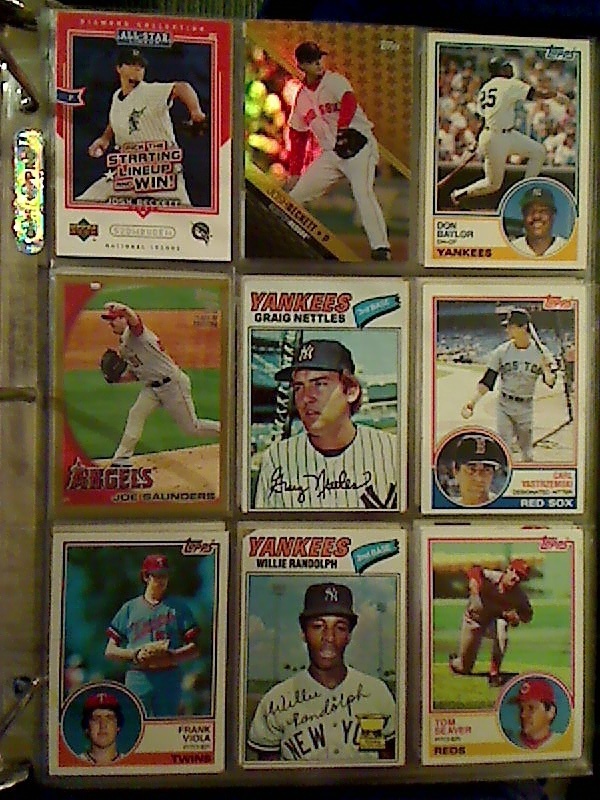 All cards except Willie Randolph are available (he’ll be going out in a way overdue trade). Thanks for stopping by! Better get back to these, the next flea market might be this weekend. 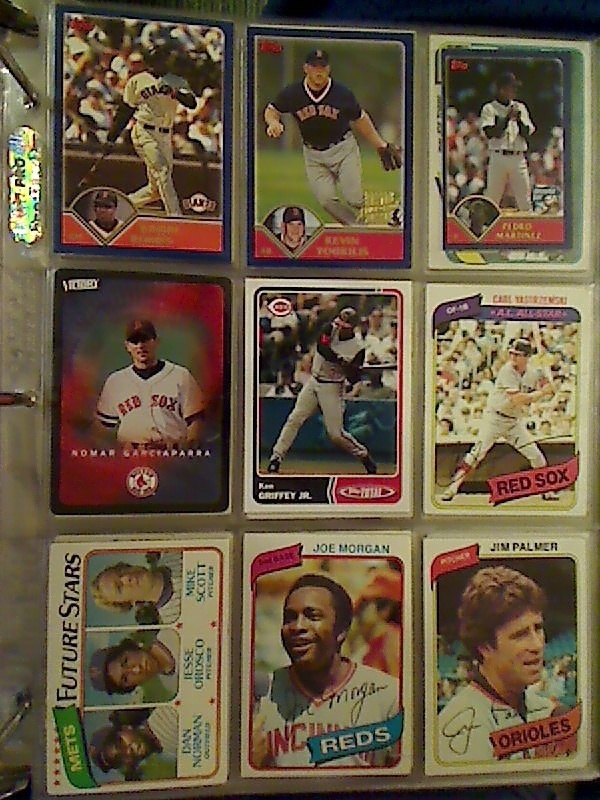 2003 topps Barry Bonds, Kevin Youkilis RC, Pedro Martinez Opening Day Game Card thing, UD Victory Nomah, 2000-something topps Total Junior Griffey, 1980 topps Yaz, Future Stars (feat. Jesse Orosco, Joe Morgan, and Jim Palmer. Why Purchased: For the almost-vintage Hall of Famers. I didn’t even notice the Youk rookie till I had already decided to purchase it. Keepers: None I guess. The Griffey doesn’t interest me very much, and the others I can probably find good homes for. Let me know if one is to your liking, but keep in mind the 1980 cards are not in the best of shape. I’m beginning to think that pre-1983 cards in mint condition don’t, and maybe never did, exist, because I’ve never seen one. And the only minty fresh ’83s I’ve seen were pack pulled by me. Oh dear, I’m ranting again aren’t I? Terribly sorry. Notes: I didn’t recognize Youk without the facial hair. It’s so inherent to him that I must’ve figured he was born with it. More cards need rounded corners. I can’t believe we haven’t started moving in that direction already. How much easier keeping cards in proper condition would be without having to worry about dinged corners. Feelings mixed on Topps Total, but without any other companies producing any baseball cards of note, it would probably be good to come back during whatever the biggest lull in the card-buying year is. I guess I’d like it personally just so there would be an easily attainable and relatively affordable rookie card on a clean (if uninspired) design of whoever is deemed the hot player of the moment. Man, Jesse Orosco looked so young! No wonder he went on to pitch so long, he was the inspiration for Rookie of the Year, making his debut in his very early teens. It’s like those “when they were young” cards, except it’s actually his rookie! I like to think Joe Morgan is saying something all haughtily & getting basic information wrong in the interview taking place on his card. Mind-Blowing Statistics: In his very first year of professional baseball, Kevin Youkilis had a .504 OBP (in 276 plate appearances), walking 73 times to only 31 strikeouts! Check out my cards had a shipping special over Thanksgiving/Black Friday weekend. 10¢ a card. So I picked up the 77 cards I’d been storing up since about March, for $7.70 instead of over $22. Well, I had mid-50s, but the $15 I saved on shipping allowed me to pick up about 21 more cards for immediate shipment. And a few days ago I finally got it all scanned. So let us check them out, one scan of one section at a time. First up, we’ll start with vintage, cuz… why not? 1960 topps Gernert, Hobbie and Cunningham AS, 1971 topps Hoyt Wilhelm, 1975-76 New York Nets (featuring Dr. J), 1968 beat up & used Yaz checklist & Manny Sanguillen rookie, and a couple Gaylord Perry's from the latter half of the '70s..
Just stare at them for awhile. They aren’t all the greatest of players or in the best of shape, but doesn’t staring at old cards just make you feel good? Doesn’t it just relax you and somewhat put your mind at ease, if only for the moment? Speaking of condition, the Wilhelm is in spectacular shape, impossibly awful centering aside. Smooth surface, four sharp corners, and no creases at all. Can’t ask for more of a ’71. Only the first five are keepers, Yaz and the bottom row are available for trade. PS: Nobody has guessed the card right yet. Everyone that guessed may try again (on that post plz). We’ll go until someone gets it right.